Why is the Camel Called the “Ship of the Desert” and How do they Walk Differently from Other Animals? There is the obvious reason why the camel called the “ship of the desert”. 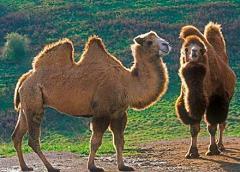 Camels can make it across a desert carrying goods, as a ship crosses an ocean. That said, if you’ve ever ridden a camel, you will see another very clear similarity between a camel ride and a ship voyage. Camels move the legs on each side of their bodies together, their two right legs step forward, and then their two left legs follow. This is different from many other four-legged animals, which move diagonally opposite leg pairs together. As a result, the camel’s motion is extremely rocky. Many travelers have tales of “seasickness” upon their first few rides aboard the hump of the desert ship, also called a camel.